Who can I share files with? How do I unshare a document? You can share a file from your My Workspace and from any group workspace you have full access to. If you do not want to share a file anymore, you can unshare it at any time. For more information, see Sharing files. Tip: You can also share a file while you’re chatting. For information, see Send a chat message. Search for a file or open a workspace. Select Shared. Then select the names of the users and groups with whom you want to share the file. 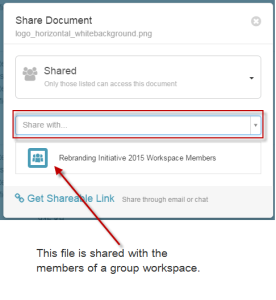 Tip: You can share with your PureCloud Directory groups. Note: Any PureCloud users who have access to the file, such as members of a group workspace, continues to have access to the file. 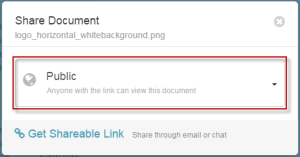 A message indicates that the link is copied to your Clipboard. Close the message and the share window. 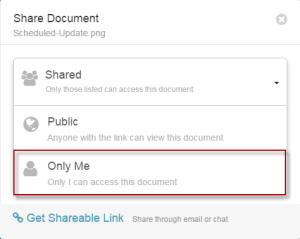 Paste the shareable link from your Clipboard into an email or chat message and send it to the people you want to share the file with. You can unshare any file in your My Workspace. When you unshare a file, anyone with whom you shared the file loses access to it immediately. Note: The Only Me option is available only for files stored in your personal workspace.